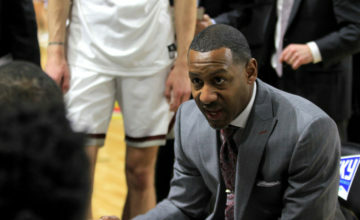 Jerome Souers hired a new offensive coordinator in Tim Plough and scrapped his customary pro-style system during the off-season. Thus far, the returns have been largely successful for Northern Arizona. On Saturday in Missoula, the Lumberjacks will receive their toughest FCS test. NAU opens up its Big Sky Conference season at Montana on Saturday. NAU had a rough outing on Saturday against FBS No. 20 Arizona. More than 51,000 watched as the Wildcats rushed for 499 yards and piled up 792 yards in a 77-13 victory. 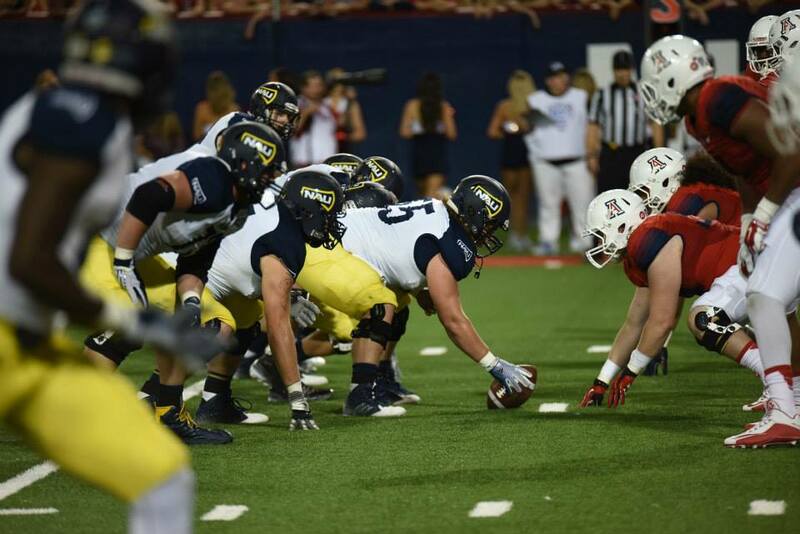 But NAU did manage two passing plays of more than 62 yards as well as 346 yards of total offense. The new spread attack has produced big plays throughout NAU’s first three games. The Lumberjacks threw for more than 300 yards in each of its first two games, both victories. In three starts, true freshman quarterback Case Cookus has been a revelation, posting an efficiency rating of 211.1 by completing 69 percent of his passes for 239 yards a game and six touchdowns. NAU is averaging 300 yards passing per outing as Emmanuel Butler is averaging 28 yards per catch and already has five scoring grabs. NAU opened up it season with a 34-28 victory over No. 24 Stephen F. Austin in Nacogdoches, Texas behind a three-touchdown performance by Butler. The game serves as NAU’ only contest against an FCS opponent as the Lumberjacks prepare to open up league play. In Week 2, NAU defeated Division II New Mexico Highlands, 41-5. Saturday will be the first piece of a first of sorts for NAU. For the first time since the Big Sky expanded in 2012, the Lumberjacks will face all the perennial powers in the same season. Northern Arizona has posted an 18-6 record in Big Sky Conference play since the league expanded to 13 teams. The Lumberjacks went to the playoffs in 2013 and knocked on the door of bids the other two seasons. But NAU never had to play Montana, Montana State and Eastern Washington in the same season. UM, MSU or Easter has won or shared every single Big Sky title since 1993. NAU opens conference play at Montana before hosting Montana State the next week. The ‘Jacks play at EWU on Nov. 7. Founded: 1899. The high research institution has 36 satellite campuses across Arizona. Enrollment: The university has 27,830 students and an endowment of $93.7 million. The Coach: Jerome Souers, 18th season at NAU. The Godfather of the Big Sky enters his 18th season in Flagstaff this fall. He’s 100-93 overall and helped the ‘Jacks to the 2003 Big Sky title. Two seasons ago, NAU made its second playoff appearance under Souers. Emmanuel Butler, wide receiver, 6-3, 210, sophomore — Butler has arguably been the Big Sky’s brightest breakout star during the first month of the season. Last season, Butler showed flashes, catching 13 passes and two touchdowns as a true freshman. This season, he’s been dominant. The Phoenix native is averaging 27.8 yards per catch and 129.7 yards per game. He has 14 catches for 389 yards and five touchdowns, including scores of 57, 47 and 36 yards against SFA, 46 yards against NMH and 6 yards against Arizona. Butler was NAU Athletics Male Newcomer of the Year last year. Case Cookus, quarterback, 6-4, 200, freshman — NAU had a verbal commitment from former Arizona and Texas quarterback Connor Brewer. But the former 4-star recruit got a late offer from Virginia and is now the backup quarterback for the Cavaliers. The late decision left NAU in a hard spot until the coaching staff found Cookus. The Thousand Oaks, California native spent last fall as a gray shirt at Ventura Junior College, meaning his eligibility did not start. He joined NAU during spring ball. He beat out seniors Kyren Poe and Jordan Perry, each players who have starting experience in their careers at NAU. Thus far, Cookus has thrown for 267 and 261 yards in NAU’s wins and has just one interception against six touchdowns. Casey Jahn, running back, 5-11, 185, senior — NAU’s resurgence in the passing game hasn’t hindered Jahn when he’s been healthy. But the senior missed his first start of 2015 against Arizona. Still, he’s averaging 103 yards per game on the ground and 5.7 yards per carry. He rushed for 157 yards against SFA, including a 56-yard run. Last season, Jahn answered the bell as well as can be expected for a player taking over for a legend. By the end of 2013, Zach Bauman had established himself as one of the Big Sky’s best-ever tailbacks. The shifty, versatile runner rushed for more than 1,000 yards four straight seasons, the first time a Big Sky back has accomplished such a feat. 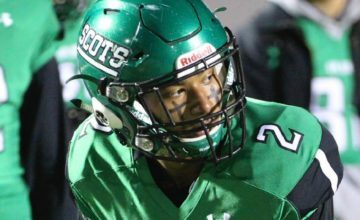 Last season, Jahn took the lion’s share of the carries in rushing for 834 yards and four touchdowns. Nick Butier, fullback, 6-1, 240, senior — The two-time All-Big Sky selection was a first-team all-league selection at fullback last season as well as earning second-team All-Big Sky honors on special teams. Butier’s numbers are not flashy — he’s carried the ball 11 times and 22 passes over the last two seasons — but he can line up all over the field, he plays almost every down and he’s one of the most hard-nosed hitters in the conference. Last week, Butier slid into Jahn’s starting tailback role against Arizona. He rushed eight times for 28 yards. This season, he’s also caught three passes for 28 yards. 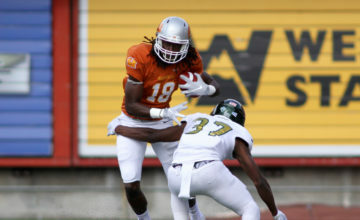 Marcus Alford, cornerback, 5-10, 160, senior — If the Big Sky had positional power rankings, Alford would be the No. 1 cornerback in the league. The two-time All-Big Sky pick earned first-team all-conference accolades a year ago despite playing more than half the season with a shoulder injury. Alford had just 27 tackles because teams rarely threw his way. When they did, he notched 10 pass breakups and picked off three passes. He’s shown it so far this season. He had nine tackles, including eight solo tackles and an interception in NAU’s win over Stephen F. Austin. Eddie Horn, strong safety, 5-11, 208, senior — Lucky Dozier proved to be one of the most important backend leaders in the league during NAU’s 2013 playoff run. Replacing him wasn’t easy. Horn did it without missing a step. The junior college transfer had 61 solo tackles and 3.5 tackles for loss among his team-high 88 stops. He intercepted three passes and broke up three more. And he played the crucial role of the quarterback of the defense in NAU’s blitzing, shifting defense. Yet he did not earn any all-league recognition. This season, he seems to be on a quest to prove doubters wrong. He has 19 tackles, including 18 solo tackles to lead the Lumberjacks’ defense. Josh Bamrick, linebacker, 6-1, 240, senior — The Lumberjacks had to revamp its entire defense a season ago. The only starters NAU didn’t have to replace were Alford and inside linebacker Austin Hasquet. In 2014, Hasquet led the NAU defense. Now he’s gone. The onus will fall on Bambrick and Jake Thomas to anchor the inside spots on defensive coordinator Andy Thompson’s defense. Last year, Bambrick had 38 tackles, 3.5 tackles for loss, a pass breakup and forced two fumbles. As a junior, Thomas had 40 tackles, three tackles for loss and 1.5 sacks. This season, Bambrick is tied with Horn for the team lead with 19 tackles. He has 2.5 tackles for loss and a sack. Thomas has 14 tackles including half a sack. Featured image by Steve August, Northern Arizona athletics. Mugs courtesy of NAU.